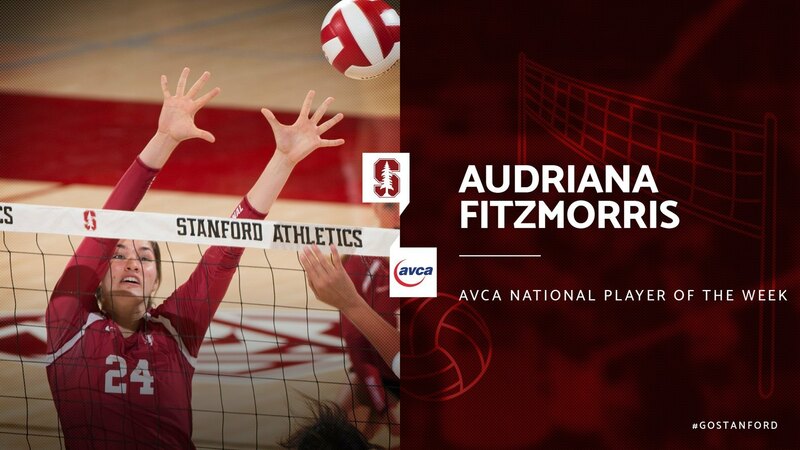 Stanford’s powerhouse freshman Audriana Fitzmorris was named AVCA’s National Player of the week- only a day after earning the Pac-12 Offensive Player and Freshman of the Week. Fitzmorris helped lead Stanford to a win over Top 25-ranked Illinois and Penn State in the Big Ten/Pac-12 Challenge in Colorado. She finished with 20 kills, 1 error, 7 blocks and 1 ace against Illinois. She’s been breaking Stanford team records, leading the team to a win over Minnesota (3) with 13 kills and 8 blocks. Her list of credentials from her high school years are extensive, but they include playing on three Kansas state championship teams, 2015 USA Today High School National Player of the Year, four-time MaxPreps and PrepVolleyball All American award and 2015 Under Armour All-American team. Despite being a freshman, the 6’6” dynamite middle blocker is helping the Cardinals move up the rankings, now holding at the 13th place. With a 23-7 record, Stanford has picked off three Top 25 teams. A 3-1 win over Minnesota, 3-2 victory over Illinois (23) and a shut-out over Penn State (10) has put Stanford in the forefront of teams to watch- with a sparkplug freshman middle blocker.